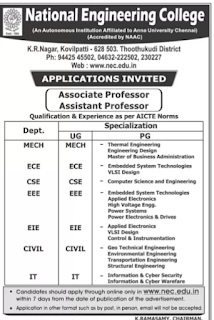 National Engineering College, Thoothukudi has advertised in THE DINAMANI newspaper for recruitment of Assistant Professor/Associate Professor jobs vacancies. Interested and eligible job aspirants are requested to apply with in 7 days from 17th April 2018. Check out further more details below. Name of the College : National Engineering College, Thoothukudi. 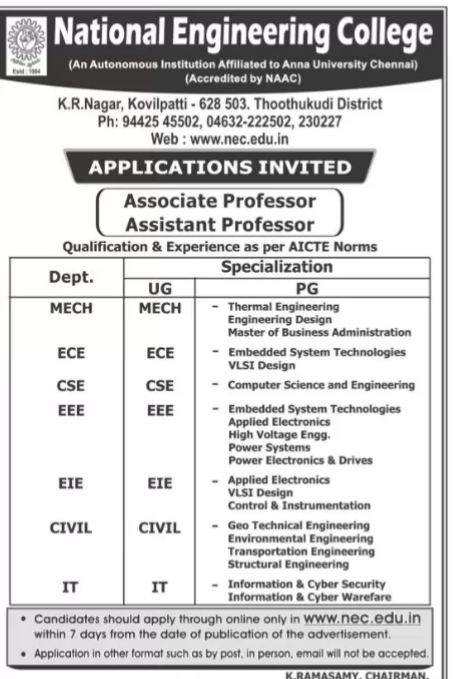 How to Apply: Interested and aspiring candidates should apply through online only in www.nec.edu.in within 7 days from the date of publication of the advertisement. Application in other format such as by post,in person,email will not be accepted.